The most influential power in a modern state, equal only to armed force and a supine judiciary, is the power of the written word. Napoleon, more than most, was aware of this. He knew how to deploy the media as an auxiliary to conquest and understood the importance of amplifying his word for the record of his glories. His maxim was, after all, “persuasion and force: with the former I make friends, with the latter I crush enemies”. Once Napoleon proclaimed himself emperor he was able to establish what was, for the time, a rather successful system for creating propaganda and suppressing information which might undermine his authority. But even before then, Napoleon had been a connoisseur of the power of the printed word. As a young and ambitious army officer he was an avaricious reader and consumer of news, and, as commander-in-chief of the Army of Italy, he had seen to it that, as he conquered that peninsula, his army and the government back in Paris would be informed of developments as he wanted them to be seen. Following success in Italy, Napoleon turned his attention to more exotic conquests and countenanced an invasion of the Levant, starting with the transformation of Egypt into a French colony. When it came to preparing for that ambitious task, Napoleon was very clear that his troops would again be supported by a propaganda campaign. The population would need persuading, and the army reminding of its civilising mission. Napoleon would therefore make sure that he brought with him the means to print. This was important because such means were entirely lacking in the Egypt of 1798. Some Maronite monks had established a printing press in Kesrouan, in the Lebanon, which had first produced a volume in 1610. A typographic workshop had even been established in Constantinople in 1488 but the first printer in the Ottoman empire only really began to operate in 1728. All of which meant that the unexpected arrival of the French and their technology was a novelty which, for Egypt and neighbouring regions, formed a key milestone in the development of the published word. So, as his fleet and expeditionary army began to gather at Toulon in the spring of 1798, Napoleon saw to it that multi-character printing presses would be loaded onto the ships. The transportation itself was not going to be a problem, after all the French had also included a piano in the essential equipment being taken along, but the technicians delegated with this task had, in addition, to guarantee that they had sufficient supplies of fonts, ink and paper. Before long the events Napoleon had set in motion overtook him and a more ambitious plan seemed appropriate, one based on embedding the press within the invasion force. To do this he would have to mobilise the resources, both human and technical, available in Paris. In March 1798 the Minister of the Interior was ordered “to make available to General Bonaparte all the engineers, artists and other personnel subordinated to your ministry, as well as the any equipment he may request for use in the expedition he will be commanding.” The minister turned to Mathieu Langlès, an oriental scholar attached to the republic’s printers, and he was asked for assistance in obtaining printing equipment and sufficient Greek and Arab characters. that Citizen Larue be asked to train an individual in Arabic typography and the cases used and on composition. Langlès was unbiddable so Napoleon settled for Langlès’ suggested alternative, a young scholar of the oriental school, the 21-year-old Parisian, and former pupil of Gaspard Monge, Jean-Joseph Marcel. Alongside his academic qualifications, Marcel could also boast experience as a print manager and journalist who knew Arabic. Marcel would aim to take with him whatever material was necessary although there was still a shortage of Arabic fonts despite the heroic work of a Citizen Duboy-Laverne to produce then in time. Such labours required money, and the cost, as well as those required for the presses, three for French, one for Arabic, and transport down to the port of embarkation, would eventually amount to 10,161 Francs. Marcel’s staff would also need paying. He would be supported by a number of experienced assistances including Beaudin or Bauduin the compositor, and Besson, Galland (an amateur poet with literary pretensions), Laporte and Puntis, the correctors. Some 18 more workers (Dizerand, Laugier, Eberhard, Lafurie, Cauzie, Barrier, Marquoy, Boulanger, Poincelot, Boyer, Jardin, Very, Dubois, Gransart, Marlet, Lethion, Castera), agreed to go. Marcel could therefore rely on 22 printers in total. Their reward would be adventure, and a monthly salary of 3,850 Livres split between them and which began to be paid as soon as they arrived in Toulon. This was the state’s response to Napoleon’s call for the means to produce propaganda. It should be noted that there was, as during the Italian campaign, a freelance element in the plans to disseminate Napoleon’s word. A second group under Joseph Emmanuel Marc Aurel of Valence was granted permission to accompany the army on 25 April 1798. Aurel, his men and his equipment were loaded onboard frigate the Justice in Toulon. This was the French contribution towards the gift to Egypt of the printed word. But Napoleon also had the resources of conquered lands available to him. More particularly, the French republic could make use of material in their most recently acquired fief, the Papal States. There, the labyrinthine corridors of the Vatican contained the original Office of Propaganda. Of the faith, true, but it boasted the tools used in Europe’s most persistent attempt to communicate with the Levant. The propaganda actually had printing presses which could print in Latin, Arabic and even Syriac. Napoleon thought he would have need of them. Monge added that among the Maronite monks in Rome there is Jonus of Aleppo who “speaks and writes Arabic and can act here as an interpreter of oriental languages”. The fleet set off from Toulon in May whilst that from Civita-Vecchia, carrying Monge, Desaix and the Roman printshop, met them off Malta that June. From there they continued on to Egypt. Napoleon ordered that “500 or 600 copies” be printed and sent ashore, then wanted 4,000 more. This was the first printed word of the French to reach Egypt. As the French disembarked, sending the liberated slaves into the hinterland, and their armies into Alexandria, Marcel’s French, Arab and Greek presses were ferried in and soon unloaded in that ancient port. These were taken to the recently vacated house of the Venetian consul Napoleon decreed that they were to be ready to print within 24 hours. The Arab press was most important as a further 400 copies of the proclamation were required as the French commander-in-chief wanted to send a batch towards Syria and take more with him down the Nile. The printers, now dubbed the French and Oriental Printing Press, began their work. Propaganda was important, and the proclamation certainly played a role in alerting the hinterland to the arrival of strangers, but the presses were also tasked with diluting the strangeness of what was, to most soldiers, a strange and hostile region. As well as the proclamation they helpfully produced a printed conversion table of local currencies and, in the coming months, as Napoleon’s armies marched south towards Cairo, they concentrated on the literature of military occupation, issuing, as they would in France, penal codes and regulations and a handful of special decrees. The printing house would remain in Alexandria until the autumn, the governor, General Kléber pleading a lack of camels to transport the heavy machinery. Following the French occupation of Cairo that July calls to move the presses south intensified but it was only in October that they, minus Besson who continued to work at Alexandria with a small press for French language material, were taken to Rosetta and then transported by barge down the Nile. They were needed because Marc Aurel, who had accompanied the army, had proved to be a disappointment. Perhaps more to their taste was the Décade Egypienne, or Egyptian Weekly, a literary and cultural periodical for the more discerning officer. The title was devised by Caffarelli and was “extremely ridiculous” according to Dr Desgenettes. It was intended to serve as a guide to the French in Egypt, as well as those beyond its shores who had an interest in the region, and it would include “whatever might be useful from the point of view of knowledge, whatever phenomenon, whatever monument, whatever quirk of nature that might have been overlooked by the best who have been before”. It quickly turned into the proceedings of the scientific institute the French established in Cairo, however, and the more ambitious hopes for its content were quietly dropped. Aurel printed just the first three issues, the cost was 20 sous for one or a subscription of 12 Livres for 10 issues. The freelancer was, however, to be removed from office by popular demand. Or at least Napoleon’s demand. 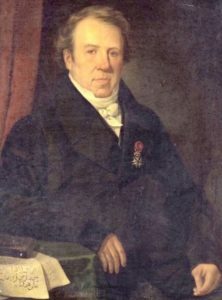 Marc Aurel would eventually sell his presses to the government and return to France, setting off from Egypt on 18 May 1800. The delay was caused by money. Desgenettes, Venture and Bourienne had been tasked with negotiating a price when Aurel first declared, in early 1799, that he wished to sell up. Desgenettes, who knew Aurel’s mother, was faintly embarrassed by the process of haggling with her son. However, negotiations went ahead in good faith. Aurel had wanted 5,000 Francs, and the trio gamely offered him 4,500. He accepted. However, then came the inevitable act of bad faith, often repeated when governments know they have the dominant hand, and it was only in September 1799 that the government settled this debt, and then only part of it, handing over 3,000 Francs in letters of exchange. Aurel left in a foul move and, with both sides mutually disappointed, never worked for Napoleon again. When, therefore, Marcel arrived in Cairo on 15 October he was welcomed as the saviour of Napoleon’s propaganda machine. He heard that the plan was to establish his headquarters in some rooms in the Institute building in Ezbekieh square, but Marcel thought those premises unsuitable for his new National Printing Press. Instead the printing equipment was sent to the close by house of El-Achqar. There was a brief interruption when a revolt broke out in the third week of October, a revolt in which many of the scientific instruments the French had brought with them were destroyed, and it seems as though the printing workshops were also damaged as Marcel put in a claim for extensive refurbishment. Poussielgue, tasked with managing the army’s finances and those of the herd of scholars, fell out with Marcel over the cost, telling Napoleon that “I fear that, yet again, there will be too many superfluous expenses.” Wrangling over money, and some confusion over upturned cases continued that winter, as the printers got established. Despite the problems, Napoleon favoured expansion, requiring Marcel to acquire five more cases of Arab characters (mym was coded 40, fe 80, for example). These were to be manufactured by Conté, the balloonist, in his own workshop. In addition Marcel was to take on five boys who knew how to read so they could be employed as compositors, and also recruited Yaqoub and Mikhayl as overseers. Marcel himself wrote how “there were too few French compositors who had been trained in oriental typography for the amount of work we had to do so I took it upon myself to teach the typographic art to a number of local boys as well as Copts, Armenians and Syrians”. Five Turkish workers were also to be given work, employed on taking care of some of the manual work and packing. There were other appointments, too. Venture, the oriental interpreter, was given the task of approving the Arabic proofs, assisting the setters by ensuring that each Arab character was given a code, whilst Fauvelet-Bourienne assumed responsibility for French-language material. It had taken a while to establish the means to print and it was only really on 14 January 1799 that the printers were capable of working at full capacity. It continued to do so without interruption until March 1800. Napoleon had by then left Egypt to restore order to France, and place himself at the end of the reformed state, but the printers continued to produce the army’s journals and the literary review, the Decade. The National Printing Press took over the printing of the Courrier (with the last one bearing the date 9 June 1801)and the Décade Egypienne, or Egyptian Weekly, also continued throughout the occupation. In addition to these two periodicals, Marcel kept busy with other projects. His list of publications, whether printed at Alexandria or Cairo, was impressive. Among the first publication to be produced was an Arab, Turkish and Persian Alphabet at his French and Oriental Printers, as well as anthology for those aiming to learn literary Arabic. More prosaically there was a study of eye disease in Italian by Antonio Savaresi, and a useful almanac which included a calendar in old and republican European style, and the local equivalents. There were a few unusual items too: a collection of fables, the constitution of France and the proceedings of the court established to try the fanatic who had assassinated General Kléber. Another piece was an ambitious one, the Tanbyeh, an Arabic call to arms which the French hoped would be distributed throughout Syria and Yemen. Marcel also aided the cause of universal knowledge by running off prints of monuments and inscriptions, and engravings of views. Here his most important contribution was probably the creation of an autograph (a kind of early lithograph) of the Rosetta Stone. The initial proof was a negative (with white lettering) and then reversed so that the characters showed up more clearly in black on a white background. It was printed and disseminated widely throughout Europe. Marcel’s final publication, a grammar of common Arabic for the French and Arabs was left unfinished as Cairo was forced to surrender to the British and Ottomans. However impressed the friends of the French in Egypt were, printing would not survive once the republic’s men departed. The printers had been moved to Gizah during the second revolt of Cairo in the spring of 1800. An uprising which saw the insurgents break into Marcel’s quarters. Marcel was wounded and his secretary, Henrici, beheaded. Tragically, the workshop was also set on fire. Gizah was not much safer and the authorities, seeing Turkish forces advancing on the city with British support, prompted the city’s governor, General Belliard, to move them to the safer citadel. They were there when Belliard surrendered the city to the Allied armies ranged before Cairo. Belliard, an able negotiator, would manage to avoid having the equipment confiscated by the British who, evidently satisfied with the Rosetta Stone and countless obelisks, allowed the French to remove material belonging to the institute which, for these purposes, included the printing presses. The general had everything packed and, in May 1801, it was transported back to France. Egypt was now devoid of printing presses. Only in November 1821 was a printer established in Egypt, the reformer Mehemet Aly maintaining one at Boulac and employing Nicholas el Machabki from Beirut and who had studied typography atMilan to produce material in Turkish, Arabic and Persian. The machinery, paper and ink all came from Italy and there were 12 local technicians although, in time-honoured fashion, there was a German overseer. As for the Egyptian machinery returned to France, General Berthier passed on orders that all the equipment, especially the Arabic fonts, were to be sent on to Paris to the Ministry of the Interior. From there they were sent to the National Printing Press soon to be run by that other Egyptian import, Marcel. Marcel enjoyed himself there, printing texts in Ethiopian and Hebrew, and producing an Alphabet of Irish in 1804. It was there, a few years later, that the French were to impress Pope Pius VII by their ability to run out documents in 150 languages and multiple scripts. Perhaps he was unaware that some of the means of production had originated in Rome. Perhaps he was merely keeping a diplomatic silence.